From time to time, Jalopnik has a blog post called "Found on the Street". (This one is found OFF the street bc its an off-road vehicle, get it!?). Its just random rare/special cars/trucks that people see parked on street then they take pics and post it. Its nice to see these indestructible things stateside. Regarding the Unimog itself, this one is powered by a 2.2L GAS engine. 80 horsepower. Yes this huge beast is powered by something that originally had only 80 hp, I wonder how much is left. A multitude of gearing (trans, transfer case, portal axles/hubs) is what allows that little bit of power to push this big of a machine up and over anything realistic. They were never (officially) sold stateside so its pretty cool to see these imported ones over here. 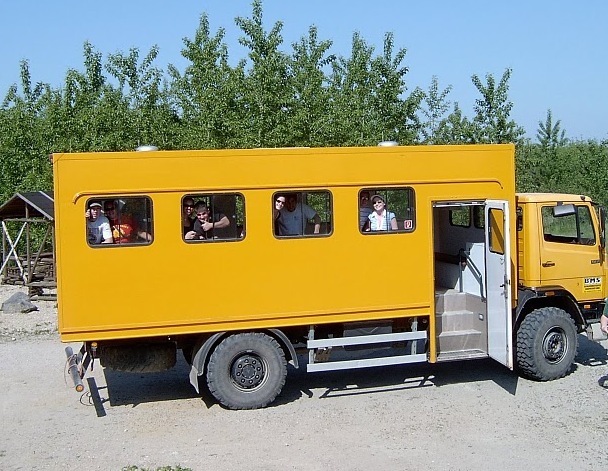 Below is a bus-style Unimog (they came in dozens of body/chassis configurations from 2-door pickup to soft-topped troop transport as seen above) that I rode in while in Germany a few years back.